If I told you that I’d found a book about family nutrition that was a real page turner you might think I need to get out more. But seriously, read on – there’s more to coaxing healthy eating than simply cutting sandwiches into cute shapes. 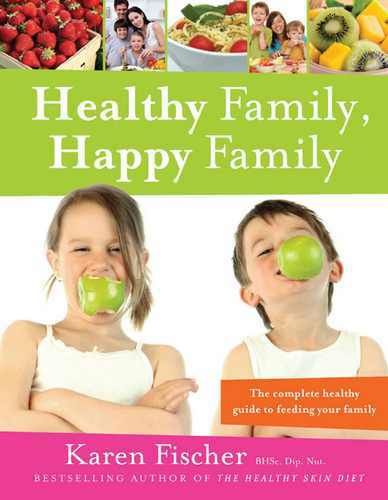 Healthy Family, Happy Family by Karen Fischer is essentially a guide to feeding your family healthy, nutritious meals. The book includes more than one hundred recipes from crowd pleasers such as the ‘World’s Tastiest Burgers’ to lunch box winners such as ‘More-ish Muesli Slice’. The recipes are all simple, straightforward and use commonly found ingredients (a refreshing change given that I have been visually ‘dining out’ on complex MasterChef creations over the past few months!). Helpfully, menu plans and detailed shopping lists are included as well as some basic recipes that can be prepared in bulk and used in different ways (as I always say, the freezer is your friend). It was the first half of Healthy Family, Happy Family, before the tasty recipes, that grabbed my attention. Firstly, it contains lots of tips for encouraging healthy eating and dealing with fussy eaters – I’m not talking about the standard ‘make vegetables into a funny face on their plate’ approach. There is a section on preventing junk-food tantrums; top ten tips for success; seven things you should never do (for example, ‘Never nag when serving vegies. Have you noticed how junk food manufacturers never hassle us to eat their products?’); forty things to do so your family will eat well and much, much more. The tips are meaty – it’s easy to reel off a list of ideas but author Karen Fischer has gone further and substantiated her ideas with strategies, research and comprehensive information. Lastly, the book decodes common nutritional jargon that we see and hear in advertising and on food products such as glycaemic index, the importance of omega-3 and managing allergies and food intolerances. Overall, I think many families will find the menu plans and recipes alone worthwhile but for me, even after feeding my large family relatively successfully for the past eight years, the tips and strategies gave me loads of super new ideas. Healthy Family, Happy Family is $33.99 and is available from Fishpond.